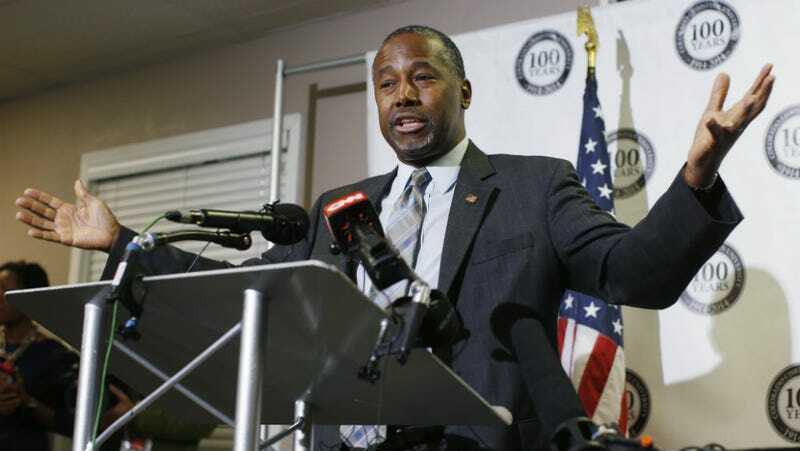 In what could be a bigger blow to his biography than potentially lying about stabbing a guy, Politico reports that Ben Carson’s campaign has admitted he lied about being offered a scholarship to West Point. This could be the end for him. The West Point scholarship is, like the stabbing, another pivotal moment in Carson’s biography Gifted Hands; in the book, he claims to have met General William Westmoreland when he was 17, had dinner with the man, and been offered a free ride to the school afterwards. He claims he declined in order to pursue his dream of becoming a surgeon instead. Carson’s campaign: setting new velocity records for both brief ascent and swift, dizzying descent.